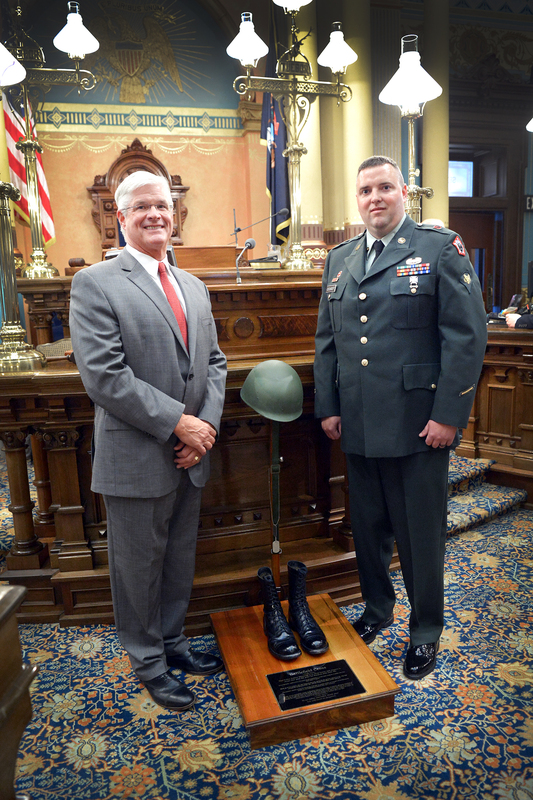 LANSING, Mich. — Sen. Mike Shirkey, R-Clarklake; Army Spc. Douglas Cockroft; and Phil Sponsler (not pictured) paid tribute in the Senate on Thursday to those who gave their lives defending America. Cockroft, a U.S. Army veteran, was Shirkey’s guest for the Michigan Senate’s 23rd Annual Memorial Day Service. Each year, the ceremony honors the service members who fought with bravery to defend the nation’s freedom. Editor’s note: Click the image for a print-quality version. This photo and others are also available by visiting www.SenatorMikeShirkey.com/photowire.